We ask that all parents and guardians who receive teamers about their child's training please respond yes or no as this is vital information for all team managers as it allows them to plan ahead as to the availability of players especially now, as games will be starting again shortly. Indoor Hurling continues every Friday evening in the Friary gym commencing at 6pm for five and six year olds. We ask all people who are dropping children to indoor hurling to please note there is a one way system in operation in the Friary grounds. We ask that all adhere to this one way policy. All roads lead to Fermoy on Saturday next where Dungarvan Colleges take on Thurles CBS in the semi final of the Harty Cup. This game has a 2.30 throw in and all support would be greatly appreciated. Best of luck to our club members involved Brian Looby, Laurence Power, Conor Prunty, Eammon Crotty and Sean Daly. A medal presentation takes place in the Friary College on Friday evening next at 7.30 pm for our western and county medal winners for 2012 at juvenile level. Again it is vital to remind all players playing or training for the year ahead in football at juvenile level up to and including minor that a gum shield is required. This is for insurance reasons and was adopted throughout the country and not just in our club. These gum shields must be worn at all football training and matches throughout the year. Co Operation in this regard would be greatly appreciated. We as a club would urge all parents of juvenile players to buy a jack the joker ticket weekly at a cost of €2. This money goes towards the club grounds and trying to make sure that our facilities for the present children as well as the children of the future are up to scratch. There are substantial prizes on offer and you never know you may get lucky! The draws for the 2013 Senior Hurling and Football Championships were held at last Monday night’s County Board Meeting. Back Row (L to R): Joe Cleary, Derek Kenneally, Paudie Shields, Declan O'Mahony, Willie Fennell, Brendan Cliffe, Gavin Keane, Derek Hayes, Donal Verling. Front Row (L to R): Aidan Landers, Jonathan Moore, Alan Moore, Barry Cliffe, Eamonn Veale, Michael Kelleher, John Organ, Michael Brett, Pat Moore. 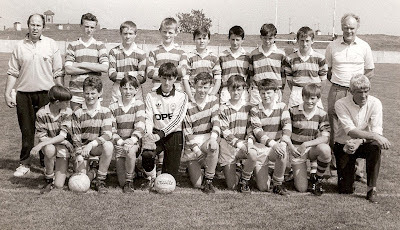 This week's photo features the Abbeyside U14 Football team that won the Western Championship in 1990, the first of a hat-trick of Divisional titles at this grade. Our popular Jack the Joker Fundraiser will continue this Sunday night in Kennedy’s Live where the Jackpot will be €7,324 as on Sunday night Louise Power was drawn out of the drum but did not find the Joker, however she did win €50, while Dennis Cosgrave and Pat and Ash won €25. We appeal to all our supporters to continue purchasing the tickets as the funds raised will go towards our ongoing development works at the club grounds. Our Bingo continues this Sunday night in the CBS Hall where the jackpot will be at €850. There will be a meeting of the Club Committee tonight Wednesday, January 23rd at 7:30 pm in the club grounds. From January 1st 2013, all players playing in all grades up to and including minors are required to wear a mouth guard in all football games and training sessions. It will be a matter for the club to ensure this rule is adhered to at all training sessions. Players and coaches should note that players will not be insured under the player injury scheme if they are not wearing a mouth guard. Therefore as a club we are obliged to enforce this rule at all training sessions. Everyone in the club would like to send their congratulations out to the Dungarvan Colleges Harty Cup team on their outstanding win over BCS last Wednesday on a scoreline of 14 points to 10. This was a quarter final tie and therefore they have now secured a spot in the semi-final of this historic competition against Thurles CBS to be played on the 3rd February. A special word of mention to our own club representatives namely Eamonn Crotty, Sean Daly, Laurence Power, Brian Looby and Conor Prunty. Hopefully playing at such a high standard of hurling will push these lads on to greater things for the club in 2013. Under 13 & 14 training continues Tuesday nights at 7pm. All players are requested to bring gum shields to training with them. Football and hurling training for under 16 and minors continue every Tuesday and Friday nights and Sunday mornings. Football will take place on the Tuesday and Friday nights and Hurling on a Sunday mornings for the moment. Again for the football sessions it is essential that every player has a gum shield. Medal presentation for the victorious underage teams of 2012 will take place in the Friary School Hall on Friday, 1st February at 7.30 pm. The players involved will be notified in due course. Indoor hurling continues this Friday, 25th in the Friary gym starting at 6pm for five and six year olds. Back Row (L to R): J. Mulligan, J. Wright, J. Kelly, S. Woods, G. English, M. Cunningham, P. Byrne, J. 'Tiger' Kiely, K. Mulvihill, S. Feehan, J. 'Chopper' Organ, É. Griffin, G. Looby. Middle Row (L to R): R. Fives, T. Kiely, T. Wade, B. Foley, L. O'Connor, J. Regan, A. Kelly, G. Foley. Front Row (L to R): J. Healy, T. 'Cub' Kiely, D. Looby. This week's photo shows the Abbeyside Minor Hurling panel that won the 1976 Western and County Titles. The Divisional Final played at Cappoquin in August saw the boys win a tight game by 3 points, 1-7 to 1-4. The County Final followed in September where Roanmore were defeated by 2-15 to 3-6. This fine team completed a Minor Double with Western and County victories in football against Affane and Cúchullainn respectively. Our popular Jack the Joker Fundraiser will continue this Sunday night in Kennedy’s Live where the Jackpot will be €7,054 as on Sunday night Lorraine Dixon was drawn out of the drum but did not find the Joker, however she did win €50, while Liam Enright and Tony Mahony won €25. We appeal to all our supporters to continue purchasing the tickets as the funds raised will go towards our ongoing development works at the club grounds. Our Bingo continues this Sunday night in the CBS Hall where the jackpot will be at €800. On Saturday night last there was a fantastic turnout in Minnies Bar for the presentation of the Western and County Medals to our under 21 football team. Our guest of honour on the night was Declan Browne who gave an excellent speech which impressed all of those present, whilst team Captain Michael O’Halloran made a presentation to the management team on behalf of the players which was no doubt very well received by all of the selectors. Tomas Kiely did an excellent job as MC on the night and kept the proceedings moving along quickly and finally we would like to thank Pat O’Brien and all the staff of Minnies for making us feel welcome on the night and providing the complimentary food to the large attendance. There will be a meeting of the Club Committee next Wednesday night at 7:30 pm in the club grounds. From January 1st 2013, all players playing in all grades up to and including minors are required to wear a mouth guard in all football games and training sessions. It will be a matter for the club to ensure this rule is adhered too at all training sessions. Players and coaches should note that players will not be insured under the player injury scheme if they are not wearing a mouth guard. Therefore as a club we are obliged to enforce this rule at all training sessions. Indoor hurling continues this Friday, 18th January in the Friary gym starting at 6pm for five and six year olds. Coláistí Dúngarbháin take on Blackwater CBS in the quarter final today in Fraher Field. Best of luck to all involved especially our club members Brian Looby, Conor Prunty, Laurence Power, Eamon Crotty and Sean Daly. Training takes place every Tuesday, Friday and Sunday mornings in preparation for the upcoming U16 football competition. The next juvenile meeting for the club takes place this Thursday, 17th January at the club grounds at 8pm. Back Row (L to R): Tony Mansfield, Myles Clancy, Ollie Keohan, Ray Quinn, Brian Hennessy, Pat Walsh, Bosco O'Mahony, John Clancy, Stephen Wadding, Joe Tobin, Billy Keohan, John Whelan, Trevor Walsh, Austin O'Connor, Donal Looby, Joe O'Riordan, Mel Shanley, Paddy Keohan, Jim Mulhearne, Johnny Morrissey, Willie Kiely. 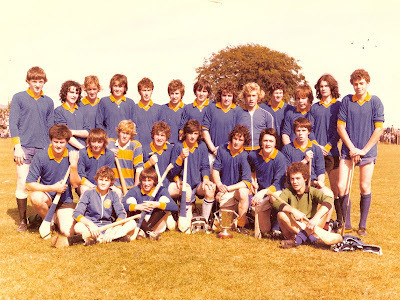 Front Row (L to R): Michael Mansfield, Tommy Wade, Dermot Ryan, Brian O'Donovan, Alan Moore, Michael O'Riordan, Kenny Killigrew, Luke Brennan, Laurence Boland, Kevin Tobin, Alan Tobin. This week's photo shows the Ballinacourty Junior 'B' Football team that captured the Western Title after a comprehensive 3-10 to 0-5 victory over Melleray in Cappoquin. This qualified the team for the quarter final of the Western 'A' Championship where they met Ballinacourty 'A' in a novel pairing. The 'A' team came out on top by 5 points, 1-10 to 1-5. Our popular Jack the Joker Fundraiser will continue this Sunday night in Kennedy’s Live at 9:30pm where the Jackpot will be €6,758 as on Sunday night Liam O’Brien was drawn out of the drum but did not find the Joker, however he did win €50, while Angeline Power and Brian Rossiter won €25. We appeal to all our supporters to continue purchasing the tickets as the funds raised will go towards our ongoing development works at the club grounds. Our Bingo continues this Sunday night in the CBS Hall where the jackpot will be at €750. This Saturday night we will be presenting the Western and County Under 21 Football medals to the victorious panel from 2012. Our special guest on the night will Declan Browne and all are welcome to attend the presentation which begins at 8pm in Minnies Bar. On behalf of all in the club we would like to wish Mark Ferncombe the very best of luck ahead of Saturday night’s Granville Hotel/WLR FM GAA Awards Saturday. Mark was a monthly award winner during the year thanks to his display against Wicklow in the National Football League where he scored three goals. There will be a meeting of the Club Committee this Wednesday night at 7:30 pm in the club grounds. Indoor hurling returns this Friday the 11th in the Friary gym starting at 6.00 for five and six year olds. Training returns this Wednesday evening after the holidays. Membership will be taken up in the next few weeks. All players will receive a membership form from their team managers. We ask that they are returned as soon as possible as players are not insured until membership is paid therefore they will not be allowed to play. Juvenile officers for the incoming year are Michael Ferncombe Chairman, Carmel Power Secretary, Kevin Tobin Treasurer and Sean Kiely PRO. The committee is as follows Damien Cliffe, Benny Flynn, Ian Kiely, Benny Kiely, Johnny Shields, Tomas Walsh, Sharon Kiely and Brendan Kent. 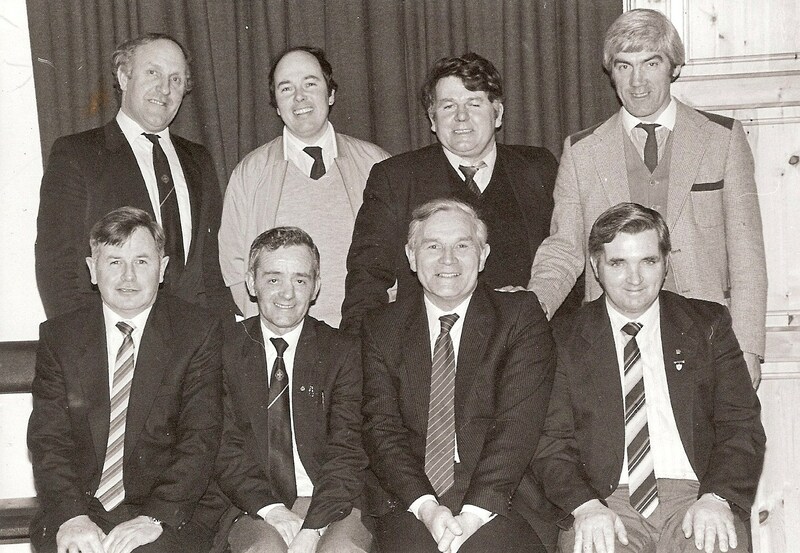 Back Row (L to R): Noel Fleming, Joe Cleary, Jimmy Lenihan, Pat Moore. Front Row (L to R): Tony Mansfield, Matthew Hogan, Vincent Mulligan, Bernard Shields. This week's photo shows committee members with Vincent Mulligan at a presentation evening held at Clonea Strand Hotel in the mid 1980s to mark his many years of loyal service to Abbeyside / Ballinacourty GAA Club. During his time in this parish, Vincent served as a player, mentor and club executive member among other roles. Our popular Jack the Joker Fundraiser will continue this Sunday night in Kennedy’s Live at 9:30pm where the Jackpot will be €6,746 as on Sunday night Kay O’Connor was drawn out of the drum but did not find the Joker, however he did win €50, while Orla Fennell and John Hurney won €25. We appeal to all our supporters to continue purchasing the tickets as the funds raised will go towards our ongoing development works at the club grounds. €25 vouchers were won by Aonghus Murray, Chopper Organ, Mary Flynn and Lorna Daly. Our Bingo continues this Sunday night in the CBS Hall where the jackpot will be at €600. On Saturday last we held our second annual golf outing and despite the terrible weather in the days leading up to the event it turned out to be another great success. The winning team was Johnny Burns, Ray Maloney and Evan Collins who had a very good score of five under par. We would like to thank Bob O’Brien and all at the Gold Coast for their hospitality on the day and Alice O’Connor’s Bar and Liam O’Connor for sponsoring the prizes. Finally a big thank you to Colm O’Hare and Peter Phelan who organised the event this year. On behalf of all in the club we would like to send our sympathies to the family and friends of the late Martin Ryan, Ballinacourty who passed away in Italy over the Christmas period. The Ryan family has had very strong links with our club for many years and Martin’s nephews carry on that tradition on the playing fields today. We also send our sympathies to the O’Donovan family, Murphy Place and to the Flynn family of Colligan on the death of Dermot Flynn. Finally we would like to send our sympathies to the family of the late Frankie Walsh and all in the Mt. Sion club on the passing of the former All Ireland winning captain. From January 1st 2013, all players playing in all grades up to and including minors are required to wear a mouthguard in all football games and training sessions. It will be a matter for the club to ensure this rule is adhered too at all training sessions. Players and coaches should note that players will not be insured under the player injury scheme if they are not wearing a mouthguard. Therefore as a club we are obliged to enforce this rule at all training sessions.